This is my entry for Taylor's Cupcake Challenge #9. I've never tried this layout before. This card is small (4.25" x 4.25"), but the picture makes it look huge. Paper: White, Soft Sky, Certainly Celery, Pumpkin Pie, & So Saffron. I don't remember where I bought the grey textured paper that looks like elephant hide. I Won a Set of Stamps! 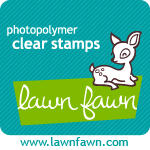 I won a set of Stampin' Up stamps by entering a card I made for Herb. Thanks Theresa! 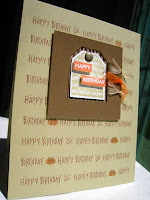 Check out Addicted to Stamps & Scraps. 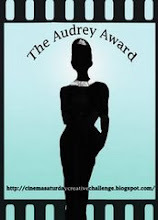 I love the title of her blog. I'm still working on a swap with my friend, Ericka and I'm trying to catch up with posting my work. I rarely stamp "Just a Note" type cards. 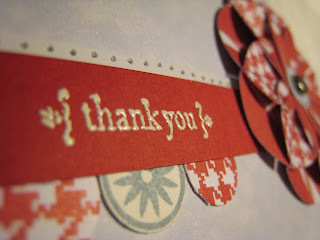 I know I've never mailed one to anybody, but part of our swap it to create this type of card. It takes me a looooong time to come up with color combos that I really like. Plus, I'm trying to use paper from my huge collection that rarely makes it onto a card. 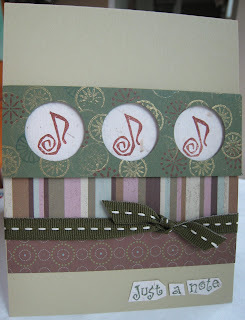 This card was inspired by a design Kristina did in February. If you haven't seen it, here's her YouTube video. Note: I'm still trying to work on my lighting and photography, so you'll notice I'm playing around with my blog entries. The cardstock in this photo doesn't quite look like River Rock. I've had this set of Making Memories Funky Vintage Embellishment Paper, chipboard buttons, clear tags and shapes since last year. 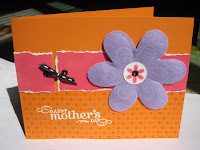 I used the scrapbook page on this Making Memories site for an inspiration to create two similar Mother's Day cards. This card is simple, but it took me a long time to design. 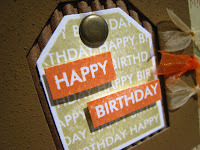 I designed the card around the Making Memories Ribbon Words I bought at Big Lots a long time ago. 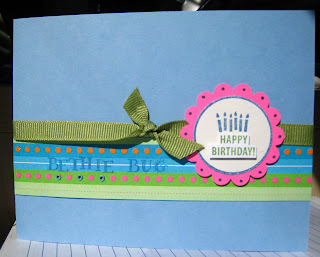 The ribbon matches the Stampin' Up Blue Bayou cardstock. I'm trying to move out of my comfort zone by trying new color combinations. 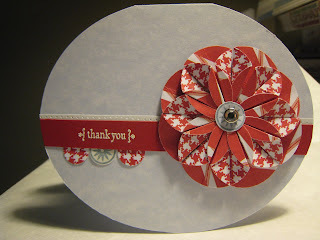 Thanks to the great tutorial by Donna Moore on Splitcoasterstampers, I created a paper dahlia for this thank you card. 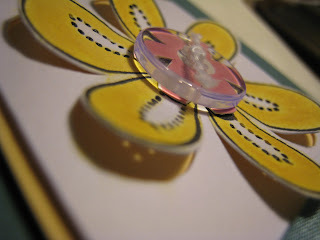 The card shape was inspired by Katrina's YouTube video where she created a circle-shaped card. I created this card for my father-in-law earlier this month. He loves his coffee. In fact, we gave him a Starbucks gift card inside the card. 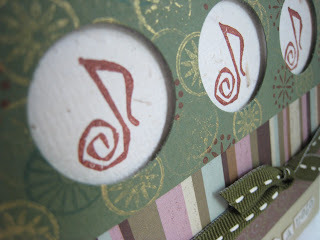 This card was inspired by a design Kristina did in February. If you haven't seen it, here's her YouTube video. Kristina, thanks for another color inspiration challenge! You made me realize I don't have Orchid Opulence in my collection...yikes! I thought I had every regular Stampin' Up color. I had so much fun in my studio because I was in such a huge rush. I was listening to vintage Earth, Wind and Fire at full volume, dancing, and making a huge mess on my desk. Orchid Opulence, Rose Red, Pumpkin Pie, Basic Black, and Whisper White. This is a card I made almost 10 years ago. I was going through my portfolio of cards I've made through the years. Ugh, some of them are boring...no ribbons, brads, eyelets, etc. I do like this Easter card. I'm usually too busy to make any Easter cards anymore. 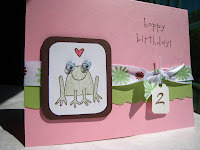 I designed this card for Kristina's Color Challenge. She was inspired by this room on the HGTV website. I had a hard time coming up with something I liked. The colors we had to use are Wild Wasabi, Blush Blossom, Groovy Guava, and So Saffron. 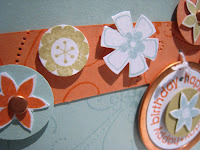 I had all the Stampin' Up ink colors, but I didn't have the matching cardstock for Blush Blossom. 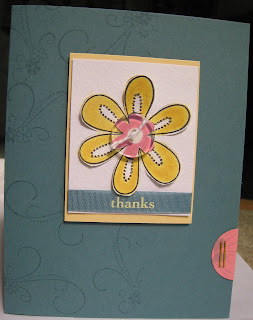 I "made" my own Blush Blossom cardstock by rubbing a piece of Kromekote with the Blush Blossom ink pad. 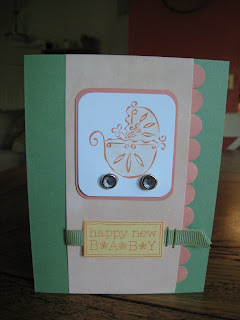 I designed a baby-themed card since I'm doing a card swap with my friend, Ericka. My family has a lot of birthdays in March. My youngest sister, Esther turns 38 at the end of the month. 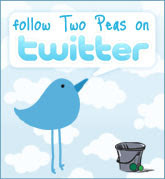 Here's the card I designed for her. 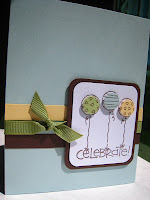 I was inspired by a card in the 2008 Sale-A-Bration mini-catalog. My niece, Elizabeth, is turning 13 this week. I've always called her Bethie Bug. Here's her birthday card. 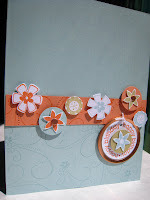 Paper Punches: Scallop & 1 3/8" circle, & Fiskars 1/16"
My brother Herb will be celebrating his 42nd birthday on Easter. He's very outdoorsy and talented when is comes to construction. He designed and helped build his current house...gorgeous! I tend not to have many masculine stamps, so it's always a little harder to design cards for the men in my life. 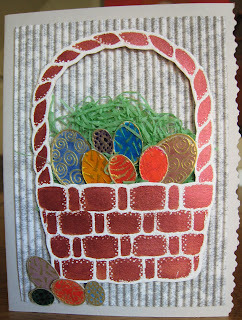 I used very non-traditional items on this card: a Starbucks corrugated cup sleeve is the larger tag punch and a textured paint chip from Lowe's. My niece, Alexa, celebrated her 3rd birthday last week. Here's a card I made for her. I choose this stamp because it has 3 balloons. My youngest niece, Saharra, turned 2 a few weeks ago. Here's a card I made for her. I made a 45th anniversary card for my parents. They are leaving on a cruise to Panana, Costa Rica, and Belize next week. In all the hundreds of stamps, I don't have a Happy Anniversary stamp. 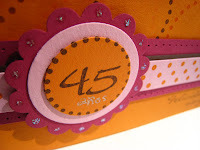 I used Felicidades Siempre (Happiness Always) and handwrote anos under the 45. I learned about Kristina when I stumbled across her YouTube videos in January. She does one called Make a Card Monday. I've subscribe to her videos. 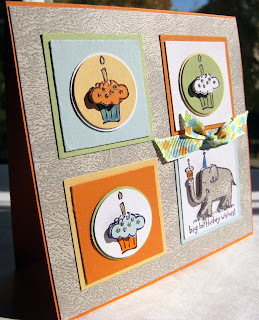 On her design blog, she gave us a challenge to make a card using these colors.